Many people will be family with the attractive bright red shiny Saga seeds, which are a characteristic feature of this species. Saga is a medium-sized tree, usually between 15 – 20m tall, with a rounded spreading uneven crown. 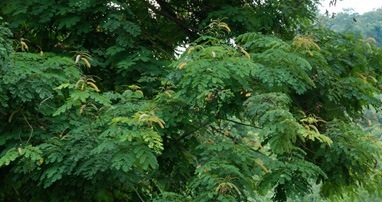 The leaves are bipinnate compound, with the main leaf stalk 10 – 40cm in length. There are between 2 â€“ 6 pairs of side stalk, and each side stalk on each main stalk, and each side stalk has between that are about 2cm in size. The leaves are dull green in colour, turning yellow with age. The flowers are light creamy yellow to organge, with a sweet fragrant smell. Individual flowers are small and star- shaped, with five tiny petals. They occur in dense spike â€“ like clusters, which are about 8 â€“ 12cm in length. the pods are narrow and cuverd, about 15 â€“ 20cm in length, by 1.5cm in width. As they ripen, they turn from green to dark brown, and they coil up and split open to release 8 â€“ 12 seeds. The seeds are bright red, hard, shiny and slightly heart-shaped. They are very similar in size and uniform in weight, with about 4 seeds making up one gram. In older trees, the trunk is slightly buttressed. The bark is smooth and pinkish-brown to grey, becomning slightly flaky with age. The wood is hard and durable and red in colour. The Saga is endemic to Southeast China and India. It has been introduced throughout the humid tropics and has become naturalized in Malaysia, Africa and the island nations of the Pacific and the Caribbean. Saga is a hardy, fast growing tree that requires relative little maintenace. Although it can grow on a variety of soil from deep, wrll-drained to shallow and rocky, it prefers neutral to slightly acidic soils. 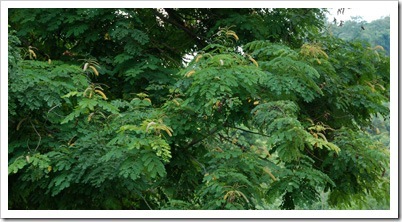 Saga is a deciduous tree and it tends to shed its leaves every 6 â€“ 8 moths. Due to their relatively uniform weight and size, Saga seeds were widely used in the past as weight measures for gold and silver. These days, the bright red seeds are still gathered to make into beads, necklaces and decoratiive ornament. The seeds can also be roasted and eaten, and are said to taste like soybeans. The hard reddish timber, sometimes known as red sandalwood, has a close and even grian and is useful for cabinetry, home building, furniture and decorative wood products. It is also valued as fuel wood, and when powdered, acn be used to make a red-coulour dye. Due to its fast growth and its open spreading crown, Saga is suitable as a shade and ornamental tree in parks and large gardens. However, it is susceptible to damage in strong winds and has a tendency to become untidy with age, droping large amounts of leaf litter, which makes it less suitable for planting along roadsides or within private residential estates. Although Saga trees are no longer popularly used for roadside planting, they can be found in lowland forests, parks and gardens, with good specimens being located within the Singapore Botanic Gardens, behind the restaurant â€œAu Jardin Les Aminsâ€ and also within the compoud of Saint Andrewâ€™s Cathedral.